Does Google Panda #25 Algorithm Update is Coming Today? 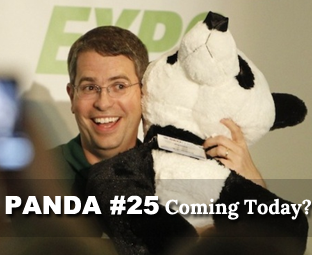 There are some early reports that Google Panda Update #25 is under progress. An ongoing thread at WebmasterWorld has some bunch of webmasters who are witnessing a sudden increase in Google Bot’s crawling activity. On the other hand, some chatter is also complaining about some early fluctuation in the Search engine ranking. About 30 days back we witnessed the Previous Google Panda update #24. There are some possibilities, and we are assuming that Google Panda update might take place either today or tomorrow. They roll out changes in Algorithm every month, so the timing is pretty much perfect for a new update. Normally, Google confirms about the updates that is taking place. However, more often they refuse to accept the refresh in their algorithm. In the last update, they did a lot of drama by first not accepting the refresh and soon after that confirming the update. We checked our Traffic statistics, and so far we did not find any fluctuation or downfall in the traffic. However, Mozcast as well as SERPs.com is showing some significant activity. On the other hand, SERPMetrics is not showing any significant changes in the crawling rate. Check out the following screenshot that shows minor fluctuations in the SERPs. Is a Panda update is about to hit us? In my option, the chances are high that we would witness the refresh sooner, probably tonight or tomorrow. However, Google can confirm that. I hope this time they will not continue their dramatic approach and would be more polite while refreshing their algorithm. Anyone is seeing fluctuation or downfall in their Traffic? Suddenly you are witnessing a drop in your SERP Ranking? If yes then, do not forget to leave your story below in the comments. We would try to help you with productive ways of recovering from the downfall. Not a nig difference yet !! But my search traffic has increased since last 2 weeks ..
No Special Change Today !! I would appreciate to have you visit my blog once and suggest a few things that you think would help improve it.. I hope it does not effect my blog ..